Ballena Blanca in her last parking spot on the streets of Cabbagetown. Another 2 months of tracking expenses is finally done. This little project can be a bit daunting sometimes because, really, we spend way too much money. But it is great to see where the money goes and be able to talk about the money we spend on the van and the changing importance of where we spend some of our money. Uke mounted on the ceiling! 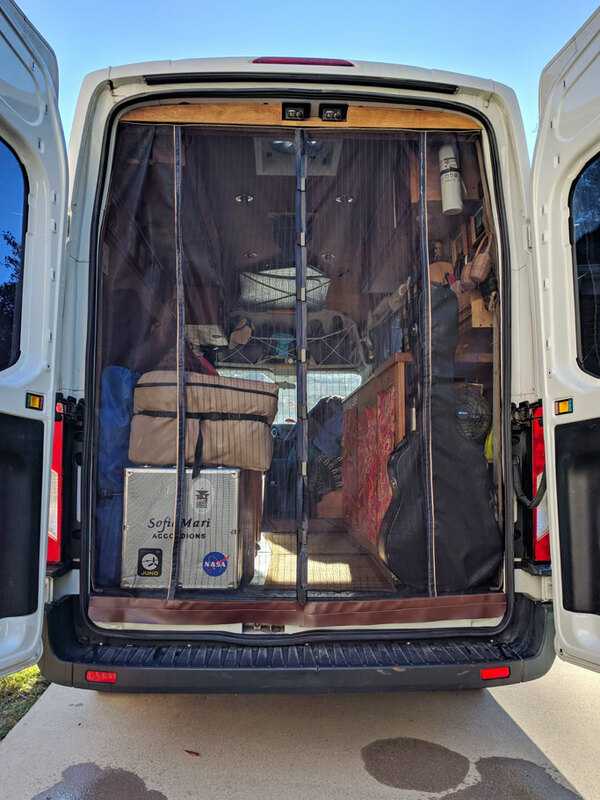 This freed up space over the seats that we are now using to store our seats and life jackets for our inflatible kayak, our snorkling flippers, and our backpack. Greg wove a net using shock cord to secure everything in. 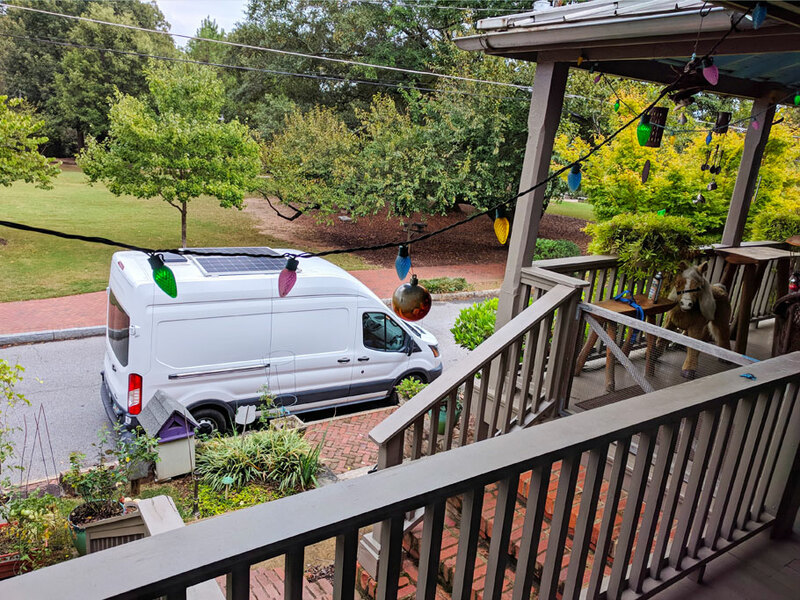 After traveling in Ballena Blanca for two seasons we were ready for some upgrades and new gadgets to make our life in the van easier and more efficient. I spent a whole lot of time on Amazon shopping for the right items, checking the size of those items, and deciding if they would fit in the van and where they would go if they did. dish towels with sewn on loops that could easily be hung from a knob. a two-sided extension mirror that had a stiff enough extension so it wouldn’t flop around. a cooler small enough to fit under our galley counter but big enough to hold fruits, vegetables, and snacks without wasting any space. a special trash bin for recyclables that would fit nicely by the sliding door. a propane adapter so we can fill 1 lb propane from our big propane cylinder (we use these smaller cans for our Buddy Heater). jumper cables – yes, I am aghast too that we have been driving around without these. A collapsible dish tub for toting dishes to campground sinks and which is more importantly big enough for us to soak our ailing feet in. An air compressor in case we have a flat – another thing we should have had a long time ago. A Swopt handle with a detachable broom and squeegee heads. More Thinsulate to insulate our sliding door. A Uke case – Although this might not sound like as van upgrade, it actually is because it has allowed us to mount the uke on the ceiling of the van. Material to make screens for the doors and to cover the sliding door where we will add the new insulation. Snaps to replace the velcro on the material that covers our lower cabinets. 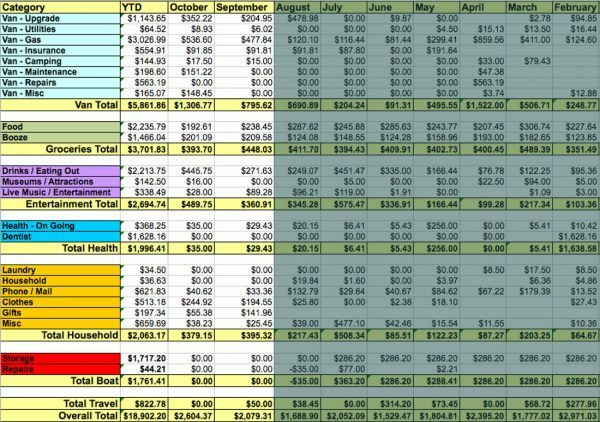 This is when I really wish I had been tracking expenses when we owned the boat – because although our year-to-date total on van upgrades comes to the large number of $1143.65, I am pretty sure this is nothing compared to what we used to spend to upgrade and maintain Blue Wing each year. After we finished up with house sitting we went to stay with Greg’s folks for a couple of weeks in NC to visit and work on van projects. One of our projects was to sew screens for the side and back doors. Hopefully this will be a major improvement in the quality of our van life. We did a little traveling in September and hit the road again in October, so we bought a little water and a little propane. In September we took a little break from house sitting and went on a little road trip up the east coast to visit family and friends and then over to Ohio for a van gathering. Then on October 11 we really hit the road again traveling first to North Carolina to spend some time with Greg’s parents and work on the van a bit – then off across the country, landing in Tucson, AZ on Halloween. On our trip up the east coast in September we camped/boondocked 3 nights. Two free nights (One in a Walmart Parking lot and one in a National Forest) and one paid night ($15) in Shenandoah National Park. Free campiing is the best, but super cheap is next best. 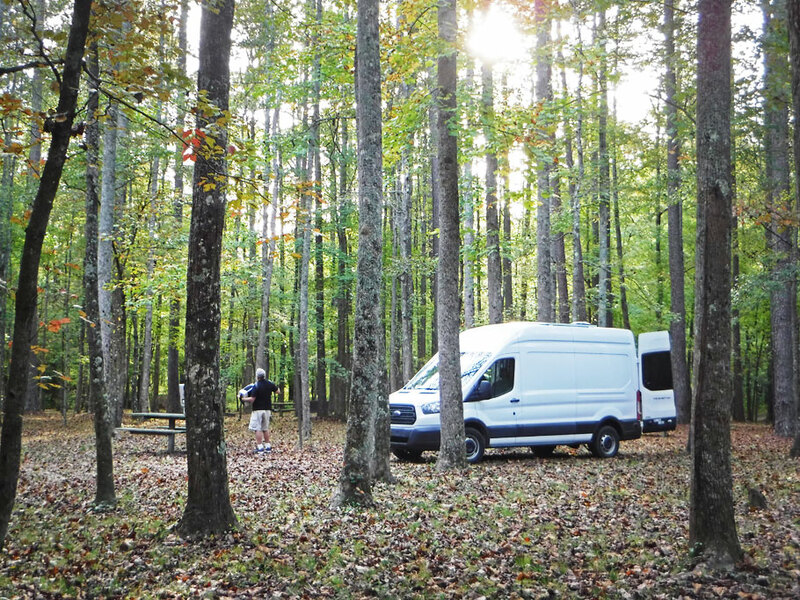 It only cost us $1.50 (half price with our Interagency Card) to camp in this beautiful spot in the Taladega National Forest in Alabama. We took Ballena Blanca in for her scheduled oil change and tire rotation and had all of her systems checked out while we were there, $151.22. The other $148.45 was for two years of Florida registration. We spent $238.45 on food in September and $192.61 on food in October. Perhaps the decrease in the October number was due to more eating out but honestly if you look at previous months with lots of eating out, there never seems to be a correlation to a decrease of our eating in numbers. 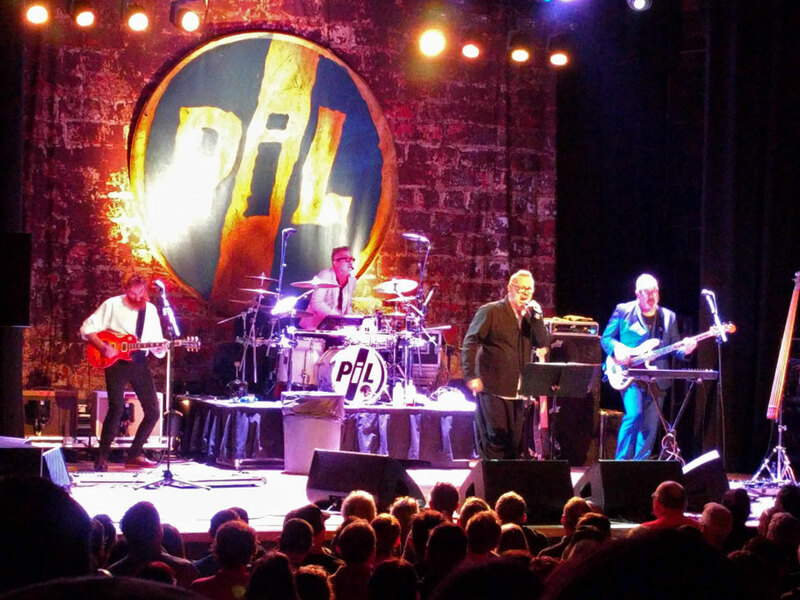 We love live music although we hardly ever go to shows any more due to cost and late hours. But when I saw that rock-n-roll legend, John Lydon (aka Johnny Rotten) and his band PiL were coming to town I bought tickets right away. It was a great show! As I have mentioned in previous expense blogs eating and drinking out in Atlanta is expensive. There was a bit of going out with friends in our final weeks in Cabbagetown. 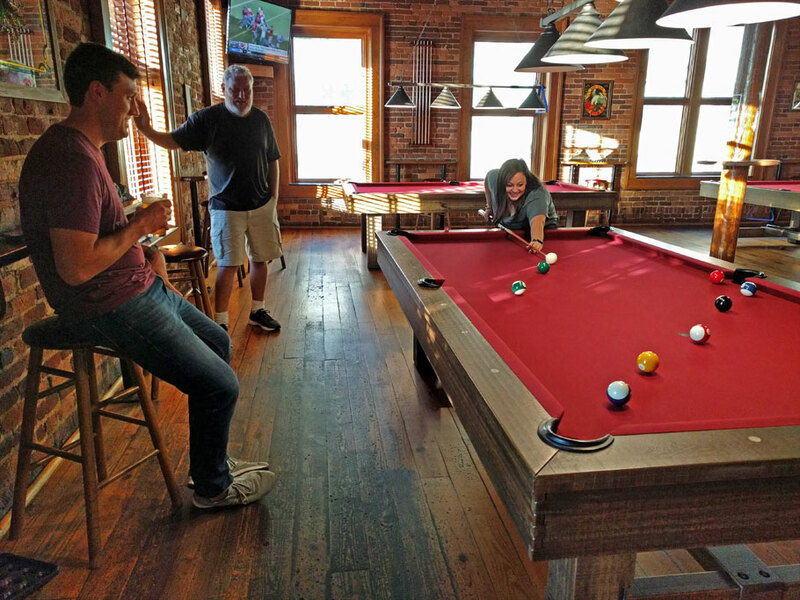 We also did a lot of treating out in September and October with visits to Greg’s daughter, son-in-law, and grandson in September, to Greg’s son and daughter-in-law in October, and to my niece on our way out west. We made a overnight visit to Greg’s son James and his wife Taylor in Greenville, SC. We treated them to beer and a few games of pool. Watch out for Taylor she may be all cute and smiles, but she is a pool shark! Just some medicine cabinet type stuff and lots of shoe inserts. Ugh – we have bad feet! Our phone plan is with Google Fi. We pay a base fee of $20 for unlimited talk and text and $10 a gig for data up to 6 gigs after which data is free up to 15 gigs. Over the summers when we live in houses and have access to WiFi it works well to keep our phone bill low. We shopped many stores to find the right boots for me. 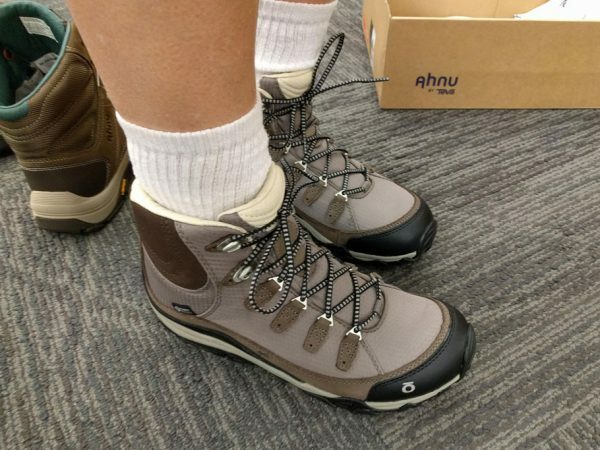 They had to be rugged for hiking, but light for city walking, good support for my poor ill foot, and be cute. Moving permanently to land and traveling in the van has required us to do a bit of a change of wardrobe. On the boat our shoes were pretty simple – cheap flip-flops, a pair of hiking /wading sandals, and maybe a cheap pair of tennis shoes. But now in addition to the change from boat life to stomping around in deserts and climbing around in canyons, we have both developed plantar fasciitis. It was time we bought good shoes with support. And, wow, good shoes are expensive! This is a brand new category! For all the years that we lived on the boat, I felt poor. It seemed like every summer we arrived back in Cabbagetown almost broke. We went from a life where we didn’t have to worry about spending lots of money finding the right Christmas gift for everyone in the family and treating all the younger family members when we went out to not spending a dime on any of them (except for the grandchild – we are not that stingy). This summer we did well making money and I decided it was time to start spreading around our good fortune again. In September and October we visited most of our immediate family bringing them gifts of chocolate and pastries – ’cause after 7 years of not buying gifts, how can you go wrong with chocolate. The Grandson. Isn’t he adorable? Who could resist spending money on him? This is stuff like guitar strings, device cords, and website hosting domain renewal. $50 registration for the van meetup in September. ** To see previous Cost of Being a Nomad blogs, click here. This entry was posted in Cost of Nomading, Nomading, Van Life, Van Projects and tagged Cost of Nomading, Cost of Van LIfe, Expenses, Van Expenses. Bookmark the permalink. Fascinating expense account and account of expenses. 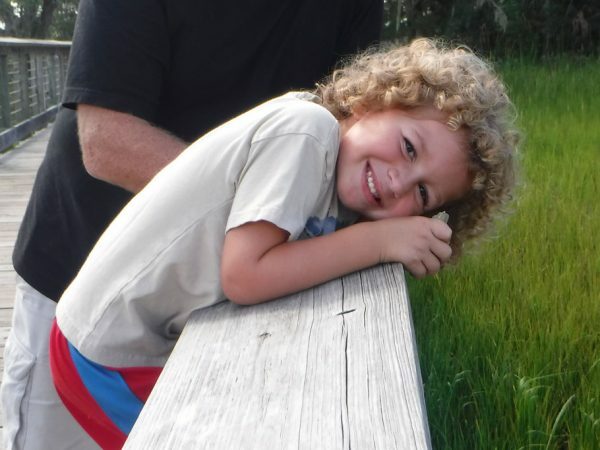 And again, beautiful shot of the grandson. Looking forward to tales from Mexico. Thanks Jo! We are pretty excited about Mexico! 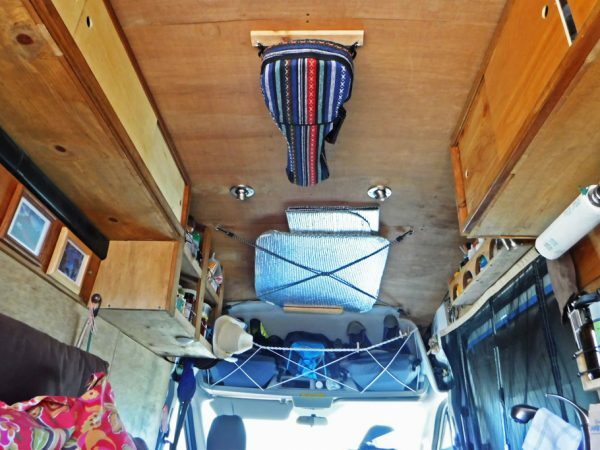 Our van expenses have been the biggest category as well, from the moment we started living in Zesty full-time. Before that, we spread the costs and projects out more. Most of it went to diesel (lots of driving), maintenance and improvements. Yet, I know this amount was even bigger when we owned our boat, Irie. Still, we are finding that the kind of camper we bought, its age and its uniqueness is where some of the money goes to in regards to parts and the frequency of which things are breaking. It doesn’t help that we’ve been unlucky with the “professionals” replacing our windshield earlier this year and creating scratches and cracks on irreplaceable parts, and us taking many dirt roads to get to boondocking spots. We had our windshield replaced this summer. It looked like it was going to be a huge production at first. Amazingly the company that handles most of the windshield replacements with my insurance didn’t have a location inside the Atlanta perimeter. They wanted me to come to them (over an hour drive) because of the size of the vehicle. They said it would take two people. I finally found someone to do it in town. One guy came out to where it was parked on the street and did by himself in an hour. No leaks so far! Boondocking is certainly rough on our van too but there is just too many dirt roads I want to go down. Next vehicle will be a four wheel drive. Also, how do you manage to spend around $200 a month on groceries for the two of you? What do you guys eat? That’s pretty incredible. Our insurance seems to be cheaper per month and it’s for the whole camper. Have you looked into different companies? I hadn’t really thought about our food expenses being so cheap. We are vegetarians – maybe that’s it, no meat. When we are in the east (or California) I try to do most of my shopping at Aldi. Second choice is Trader Joe’s. Chain groceries are the worst for good produce prices. Also maybe it is because we don’t eat too much prepared food. I need to look into the auto insurance thing. We might be cheaper as a camper, not a van. Also I have the lowest deductible possible since it is our home.